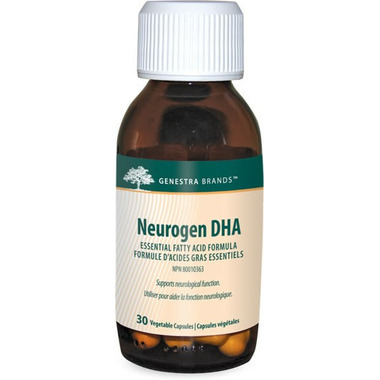 Genestra Neurogen DHA is an effective combination of the omega-3 fatty acid DHA and vitamin E that helps to support neurological health. As vegan and vegetarian diets tend to provide significantly less DHA, algae-derived oils provide a vegan-friendly omega-3 source with a low impact on the ocean ecosystem. Recent research demonstrates that DHA deficiency decreases the level of brain-derived neurotropic factor in the hypothalamus and hippocampus, which is necessary for brain plasticity and function.